Salary negotiation is a crucial aspect in interview process, and commences almost at the last stage. After impressing the employer with your skill sets, and receiving the job offer, salary negotiation has to be done. For the negotiation to be successful it is important to understand the job role, the number of years of experience, industry standards, and the technical skills required to perform the job. The employer would offer a salary, based on your current job salary, expected salary increment and promotion. You can write a salary negotiation letter based on the template mentioned, stating your reasons for asking additional salary. You have to justify well about your skill sets, your previous experience and other job offers. 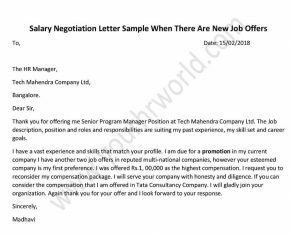 You can write a letter or send e-mail after receiving job offer. Thank you for offering me Senior Program Manager Position at Tech Mahendra Company Ltd. The Job description, position and roles and responsibilities are suiting my past experience, my skill set and career goals. I have a vast experience and skills that match your profile. I am due for a promotion in my current company I have another two job offers in reputed multi-national companies, however your esteemed company is my first preference. I was offered Rs.1, 00,000 as the highest compensation. I request you to reconsider my compensation package. I will serve your company with honesty and diligence. If you can consider the compensation that I am offered in Tata Consultancy Company. I will gladly join your organization. Again thank you for your offer and I look forward to your response.